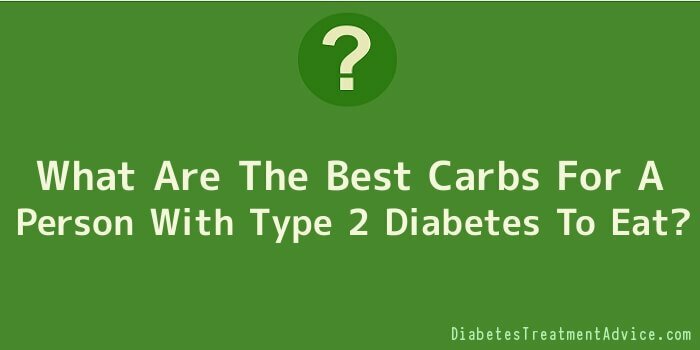 What Are The Best Carbs For A Person With Type 2 Diabetes To Eat? When it comes to food, there are three main components that can give your body energy. They include fats, proteins, and carbohydrates. It’s important that you have all of these things in your diet in order to stay healthy. Even if you have diabetes, you need to include some carbs in your diet. However, it’s important that carbs are well balanced and that you eat the best carbs for your body when you have type 2 diabetes. Many are wondering what the best carbs for the healthiest type 2 diabetes diets are. Well, let’s take a closer look at carbs, how they work, and the best ones to consume for those who are dealing with type 2 diabetes. First of all, you need to realize that there are two different types of carbs. There are sugars and then you have the starches. The sugars include things like glucose and fructose. Fructose is the sugar that you mainly find in fruits, while the glucose is sugar that you find in various foods, such as soft drinks, cookies, and cakes. There is lactose as well, which is the type of sugar that is in yogurt and milk. Then you have starches, which include various veggies, such as peas, corn, and potatoes, and it also includes rice, breads, and even cereals. While you probably are aware that carbs need to be limited, you will find that carbs are still important to a good diet. Carbs can make the levels of blood sugar rise, but you still need to have them in your diet. Of course you probably want to know what the best carbs are for a person with type 2 diabetes to eat. Well, you’ll definitely find that there are some carbs that are better for you than others. Whole grain foods, veggies, and fruits are much better for you than foods that are full of sugar. Sugary foods, such as candy or sodas, usually, only have empty calories and they never provide you with the nutrients that you need. So, it’s important that you add the healthy carbs to your diet. The one type of carb that doesn’t rise up your levels of blood sugar is fibre. This is why fibre is such a great choice in your diet when you have type 2 diabetes. Fibre is important for everyone and the fibre helps to make you feel fuller and it also aids the entire digestive system. Unfortunately, you’ll find that most people don’t get the fibre that they need. In order to actually control your blood sugar, most experts believe that you need to include more fiber in your diet. So, if you are wondering what the best carbs are for a person with type 2 diabetes to eat, fibre is definitely a top choice. So, it’s very important that you realize that there are different types of carbs and that some are good for you. You should never try to entirely cut out carbs from your diet, since you won’t be able to get many of the nutrients that your body really needs. Learning which carbs are healthy choices is very important and can help you to better control your problems with diabetes.